Financial independence can mean different things to everyone. A 2013 survey from Capital One 360 found that 44 percent of American adults feel that financial independence means not having any debt, 26 percent said it means having an emergency savings fund, and 10 percent link financial independence with being able to retire early. I define financial independence as the time in life when my assets produce enough income to cover a comfortable lifestyle. At that point, working a day job will be optional. But what about the rest of America? How would you define financial independence? If freedom from debt is what you're seeking, here are five areas that could be holding you back. If you're not planning for financial independence, chances are you won't reach it. The future is full of unknowns, but having an idea of when you'd like to achieve financial freedom should be your first step. 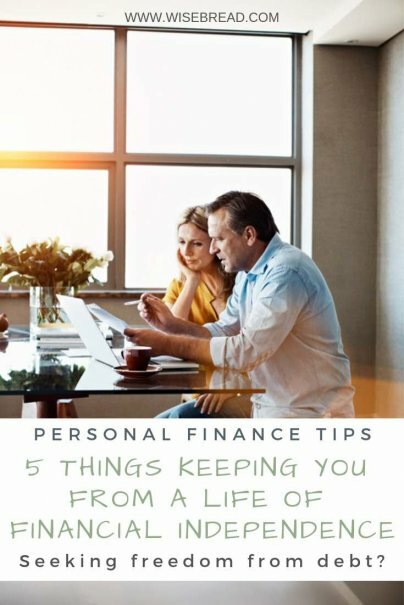 It's important to identify how much you're currently saving, and how much you need to save in order to retire when you want to, or reach another major financial goal. Using a calculator like Networthify can help you play with various money-saving scenarios and make realistic projections about retirement. If you're carrying a credit card balance each month, financing cars, or just paying the minimum on your student loans, compound interest is working against you. Creating an aggressive plan to pay off debt quickly should be a number one priority for anyone who is serious about achieving financial independence. Otherwise, your money is working for your creditors, not you. If you prefer to tackle credit card debt first, there are several debt management methods you can try, including the Debt Snowball Method and the Debt Avalanche Method. The Debt Snowball Method has you paying off the card with the smallest balance first, working your way up to the card with the largest balance. The Debt Avalanche Method is similar, but here you would pay more than the monthly minimum on the card with the highest interest rate first, working towards paying off the card with the lowest interest rate. Both are highly effective methods, and choosing one really just depends on your preference. A high income does not automatically make you wealthy. As you move up in your career, the temptation to upgrade your lifestyle to match your income will be ever-present. After all, you work hard, so why not reward yourself with the latest gadgets and toys?